Anime Power Ranking « Geekorner-Geekulture. I actually had this write-up 90% written for 3 days, but just didn’t put in the last 10% and didn’t release it. My bad. Been feeling badly, so aside from not finishing the post, Kuromukuro, this week’s Joker Game, and Kagewani are missing. Enjoy! I’ll try to get to comments this weekend, on the Snow White with the Red Hair post as well. As always, the list is ordered by how much I liked the episodes, combined with how good I thought they were, in a descending order (first is best, last is worst). This time ordered by “tiers”, in each tier most shows are about equal for me, organized alphabetically within tiers. Was a weird week in a way. Can only punch once before he’s out ? The new One Punch Man, now +heart! 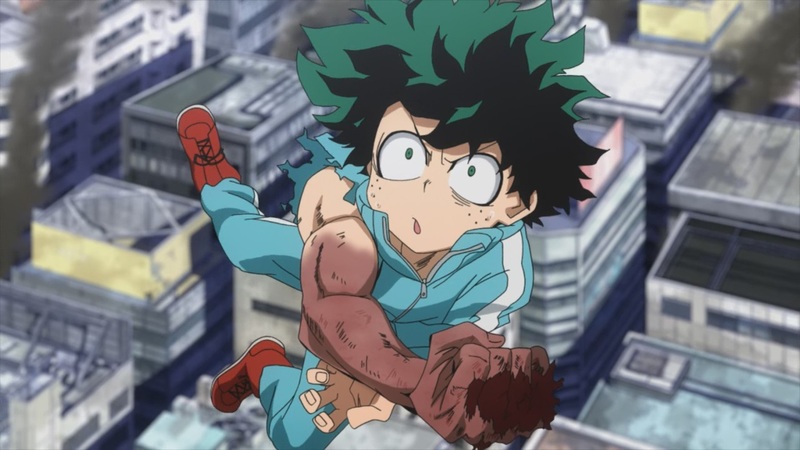 It seems as if My Hero Academia operates in “Tick-Tock” cycles, where we have an episode that’s mostly build-up and is slow, and the episode that follows cashes in on all that build-up, giving us cool action sequences, tearful thematic moments, and the desire to watch the next episode right away. Thing is, as good as those “uptick” episodes are, the time until we get to them is frustrating. I’m not sure whether covering these 4 episodes in 2 would’ve been workable, or if covering them in 3 would’ve had good stopping points for episodes 1-2, but there’s definitely an uneven quality to the show due to its pacing. Third week is here, and only a couple of premieres were left. 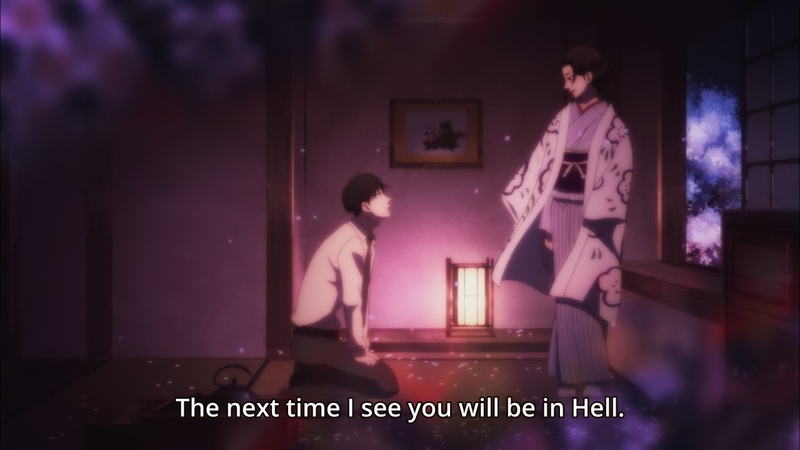 This show is ridiculous, I mean, due to the earthquakes in Japan, Sakamoto and Kabaneri were both delayed, and I still found myself almost overwhelmed by the number of shows I’m covering. 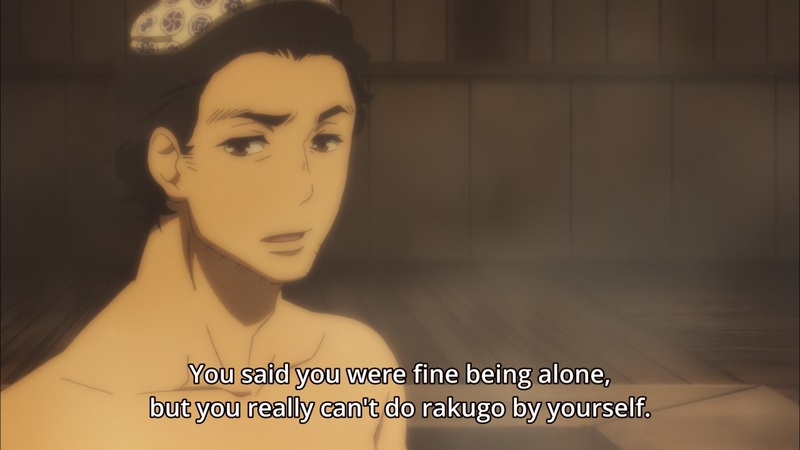 I didn’t get to watch Joker Game this week, because of how busy I am, and how tired watching shows in one-episode increments makes me, but more on that in the overview at the end of this post. I wonder if such an episode could have taken place in a show other than Concrete Revolutio. There were elements here that could’ve existed in Samurai Flamenco but didn’t. The raw number of topics brought up was very Gatchaman Crowds-esque, and the spin on history was necessary. So, what did we have this episode, if we boil it down? How we’re shackled by society and expectations, and how the quest to not be beholden to others is the quest to end society, or remove ourselves utterly from it. 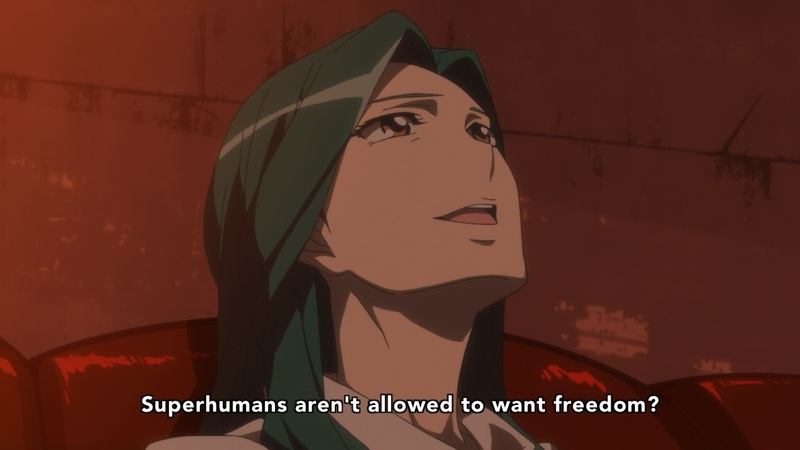 But not because we want to be “free”, but because the specific laws in place constrain us. So, we deal with how idols and superheroes are shackled by public expectations, and discrimination against homosexuals, and those who go against the government, and superheroes. Because all of these go against the order of “How Things Should Be™.” Idols are so powerful and so held in line because they are the epitome of how things should be, how people should be, how they should be kept safe. Not from harm, but “under control”. The second week of a season is where I expect to mostly cover second episodes, but not this time! We’ve had many more premieres this week than shows airing their second episodes, and as such, we’re still in premiere-coverage mode! A short to medium write-up on each, with links to full first-impressions for most. At the bottom of the post I also order all the premieres of the season by how much I liked them, alongside helpful links. 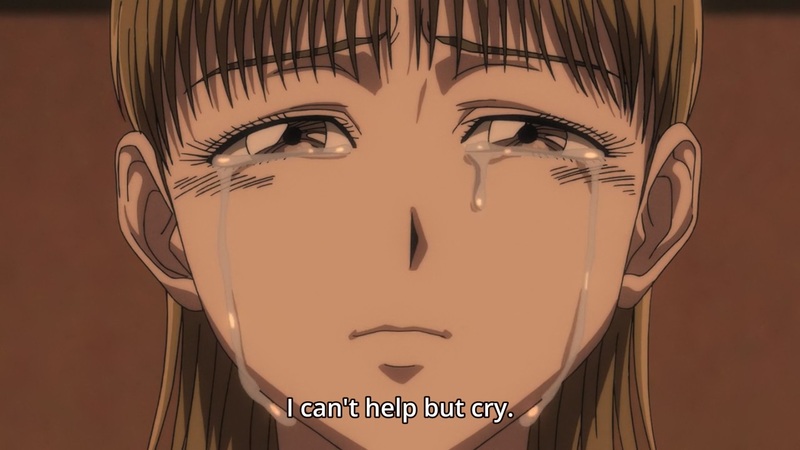 Ushio to Tora’s last episode was sad. Really sad. It had shown us the cast, working their way through their issues, only to be torn apart and for a character to feel lonely, for a relationship to be torn asunder. This episode was worse. Much worse. By which I mean, it was so very good at being painful. It had evoked the show’s most heart-rending moment to date (Jie Mei and Giryou’s role in crafting the Beast Spear in episode 20), while making sure its cast is given agency. No matter what, someone had to sacrifice themselves, because they could not live with the knowledge the other one died for their sake. A selfishly unselfish decision. A save in the nick of time, and our heroes, well, also sacrificing themselves. This episode was a string of heavy moments, of the youkai crying as they look on at another’s sacrifice for their sake, for their desperation. The show did have a moment or two of levity, but it didn’t feel as if it robbed the other moments of their effect, but as if the show were giving us a moment to catch our breath, so we could keep on going. Another season, another slew of premieres! A short to medium write-up on each, with links to full first-impressions for most. I missed you too, buddies. The gang is back! I actually found myself surprised as this episode started because it felt as if we’re going back to the episodic structure of the show’s start or the first season’s last few episodes, and it’s not like this show has much time to waste. But worry not, the show quickly moved from establishing normality to shattering it in a manner that made me tear up, because I care for all the dorks in this show. Stakes raised, action, emotions. 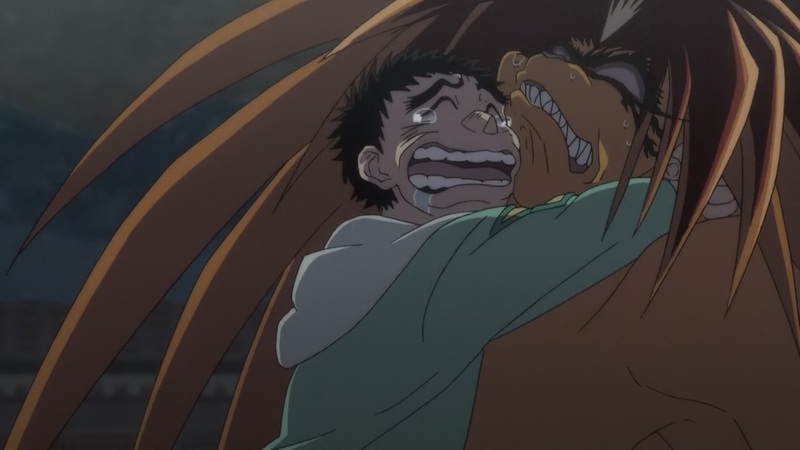 Everything that made me care so much for Ushio to Tora is here. Silly faces too, I’m glad to report. 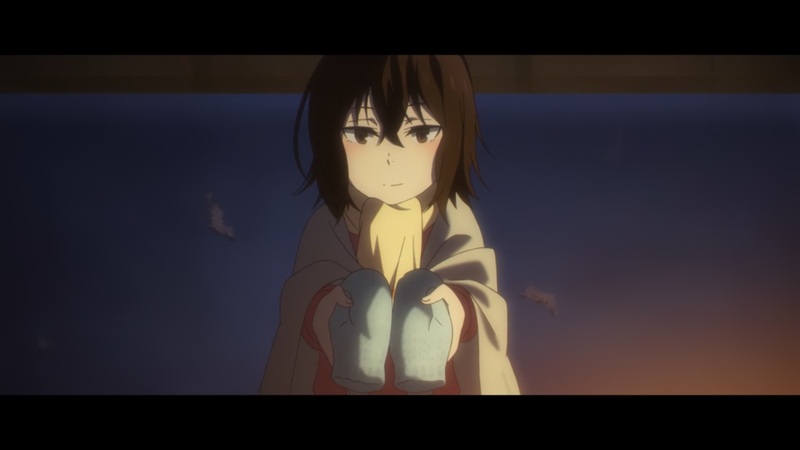 This episode was so cute, and comfortable, and sweet. Since the best word to describe this show is “fraught”, seeing how there’s a sense of fighting against the inevitability of Kayo and Satoru’s mothers’ fates, this sweet respite from cliffhangers and tension only promises what is to come will hit us even harder. It feels as if the show had allowed us to catch our breath, a risky business in a fast-paced thriller, but it’s only done so so we could scream from now on until the series concludes.